Just when you're tired of hearing about new apps for your iPhone, here's one that can actually help out a New Yorker underground. A brother and sister team by the name of Jonathan and Ashley Wegener tell me they spent months checking out subway stops to better inform you where to stand so you can get where you need to go on the train. The app is called Exit Strategy NYC, perhaps you've already heard of it, perhaps not. 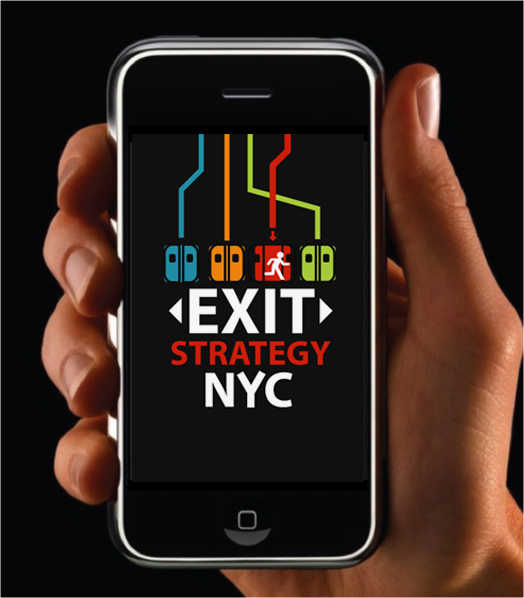 (exitstrategynyc.com) Either way, this is what the app contains: the locations of exits, transfers and elevators, as well as hours for exits that close. According to the Wegeners, this information can help you make the decision when forced to choose from among four different exits at one subway stop or choose which subway transfers to take. The three-touch process works on your Blackberry too. First pick a subway line, then choose your direction, uptown or downtown, and then select your destination. No worries, even if your phone loses service, and it probably will underground, Exit Strategy does not require an Internet connection. While others frantically scan large and frequently confusing subway maps to find where they need to go, you can search by pressing the buttons on the small device in your hand. "This is the first time that something like this has been done on a large scale in New York City. Everyone has a little bit of data but no one has the entire puzzle," says Jonathan. Actually the origins of the idea came from his own habit of jotting down on his iPhone which exits were best to take when traveling around the city. Sister Ashley jumped on board after hearing him out on the concept and they embarked on their underground adventures to chart the course for everyone else. Did the two go to a high-priced programmer to put their package together? Not on your life. Jonathan's roommate from Columbia Benny Wong, performed the programming chores. What are friends for? Since Exit Strategy's release, emails have been overwhelmingly positive according to Jonathan. The users have even coined new terms for trying to find the best places to stand: platform strategy, one-positioning, pre-walking. The price of the app is now $2.99, less than the cost of a round-trip on the subway, and you can download the convenience from not only your iPhone and Blackberry, but also GI phone and Kindle. Jonathan and Ashley spent many an hour riding trains and mapping stops, but the long ride may just have paid off. Exit Strategy was the featured iPhone application in the App Store, the first time for a local. One reminder, don't confuse "Exit Strategy NYC" with "Exit Strategy" which calls you in order to let you bail from an awkward situation or a meeting. The first helps you go somewhere; the second helps you leave where you are. If you want to read more of my stories go to nbcnewyork.com and check out GossipGram.